Something big is starting to happen in the world of activism. Grassroots campaigns are beginning to coalesce into coherent, focused missions with definable outcomes. The Divest campaign is a classic example of how the People can have a tangible effect on society by speaking the language of the dominating classes: money. Divestment is what it sounds like: removing public investments from corporate institutions, and repurposing them into organizations which will benefit the common good. This means leveraging the collective will through mass individual actions to force the perpetrators of corrupt and unscrupulous behavior to directly lose profits; in essence, to divest is to boycott. Even in the world of international affairs, we hear of sanctions, which are nothing more than state actors divesting from another nation in order to conduct economic war. On the domestic front, we too face war- class war. As Warren Buffet, one of the richest individuals on earth put it, “there’s class warfare alright, but it’s my class that’s winning.” So applying this divestment strategy at the grassroots level to win very real battles in this economic war on behalf of the People is key to changing the world for the better, because it works. At minimum, it sends a symbolic message that we are creating a culture of higher virtues and principles in which the divested institution and others like them are not welcome anymore. At best, very real systemic change can result. We are immersed in a post- Reagan era where the pendulum has swung away from America’s “big society,” the era of progressivism and the New Deal when our center was generally much further left. We have now come so far the other way that the wholesale dismantling of public programs in favor of a pro-big business agenda has transitioned from subtly disguised under Clinton and Obama neoliberalism, to naked and overt in the Trump era. Our center has shifted, and our society faces the consequences of this shift. However, one unintended consequence of this big business-first culture is the fomenting of an increasingly organized left. This new left, feeling isolated and underrepresented in the grand halls of the federal government has been forced into city halls and state assemblies. Our current political climate is arguably beginning to surpass even the emotionally charged protests of the 1960’s as we see a more politically charged youth than we’ve seen in generations. So undisguised is our big-business paradigm that when builders of the Dakota Access Pipeline obviously broke the law in North Dakota by illegally building on sovereign indigenous land with no approval by the local population, the police sided with the oil company, culminating into the brutal attacks on local demonstrators at Standing Rock. These peaceful indigenous activists were simply standing up for their right to protect the local water supply, yet attack dogs, tear gas and firehoses were unleashed upon them, in order to clear way for big oil. The resistance was so strong and inspiring that sympathizers across the nation would begin to pour into Standing Rock. The cries of the water protectors were heard across the nation. Then something momentous happened- Seattle voted to divest their municipal bank accounts from their primary bank- Wells Fargo, due to their investment in the pipeline. Protest had officially been transmuted into effective legislation. Standing Rock was now everywhere. We were inspired and decided to follow suit in Los Angeles, led by Seattle’s shining example. Divest LA was born. The theory and strategy are straightforward: the People within a municipal constituency pay taxes to their government, which then need banking services to manage those finances. Often, the banks that handle municipal accounts are also those that are guilty of fraud and corruption and invest in socially and environmentally destructive businesses. Therefore, We the People are complicit in the crimes of these businesses because we support them with our tax dollars. We have the ability to change this by demanding that our elected representatives truthfully represent us by barring unethical institutions from having access to public money. 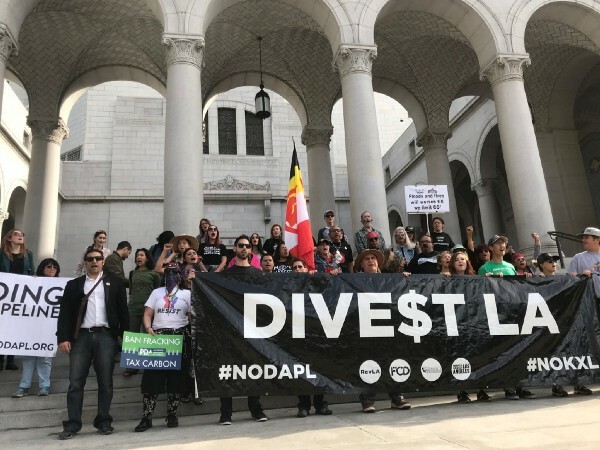 In December 2017, after less than a year of campaigning, Los Angeles City Hall officially voted to divest their money from Wells Fargo. Emotions were high as countless hours of researching, protesting, campaigning and lobbying by activists, indigenous leaders and supporters finally paid off. A very real victory was accomplished in one of the largest cities in the nation, leveraging our city government to have a tangible effect on one of the largest institutions on Wall St.
We sent a message: Our city will not support businesses that engage in environmental and social destruction. LA is one more city in the chain reaction that began with Seattle. Cities across the US have also sprung up their own divestment campaigns. The tone is set: if we can do it, so can they. Something big is about to happen, the dominoes are set to fall one by one as other cities everywhere follow this example. The key question is: What is the ideal outcome of this movement? The answer can be both sobering and exciting, but it is clear that we must continue forward motion while the tailwinds of change are gaining strength from the momentum of these successful divestments. We have an enormous opportunity to define the narrative and the strategy that will determine what this chain reaction will look like. We need inspired activists to follow suit in their own cities. By asking what the ideal outcome is, rather than merely a good one, we arrive at an end goal that transcends any one symptom of our broken system, into a changing of the system itself. 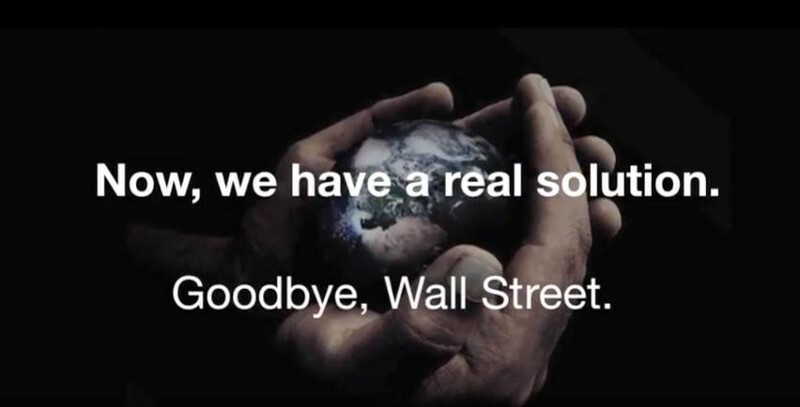 This is why the divestment movement is ready to evolve into the Public Banking movement. Public Banking is nothing less than FULL DIVESTMENT(and RE-investment). Divestment is a technical victory and has been an extremely important first step in the evolution of the movement, but the next phase in this evolution must be Public Banking. For a city to divest from a bank means to move from one private bank into another private bank. This addresses one symptom within the system of private banking that still permeates. For a city to create its own public bank owned by the People and accountable directly to them, is to create an entirely new financial system on the People’s terms, which is the logical end-game of divestment. Instead of putting the money into another big private bank like divestment 1.0 does, it creates an entirely new bank with social and environmental responsibility defined in its charter. Public Banking is the end of the line- the final frontier of divestment. Is that the best we can do? Less bad? It was at that moment the idea of Public Bank LA was born. Why settle for a symbolic victory, with Wells Fargo as the sacrificial lamb, only for another Wall St. firm to gain the contract? Is that system change or symptom change? The truth is, the divestment movements across the country will end up facing similar conundrums. The inevitable question of where the money will go will arise. And then Wells Fargo’s cronies in the bank oligarchy will simply pick up the contracts. Indeed, Seattle ended up being forced to return to Wells Fargo since no other banks picked up the contract– proving that a Public Bank of Seattle is truly the only route to success. That’s why it’s time to evolve our view of divestment. Divestment is not a war victory, it is a strategic victory of the first battle of the war. Developing Public Banks specifically designed to be transparent, accountable and socially and environmentally responsible will completely change the financial sector from an antagonist of the common good to arbiter of the common good. Then the war will be won. Banks don’t have to be self-interested, profit-chasing, exploitative, private businesses. They can be publicly owned and publicly accountable. 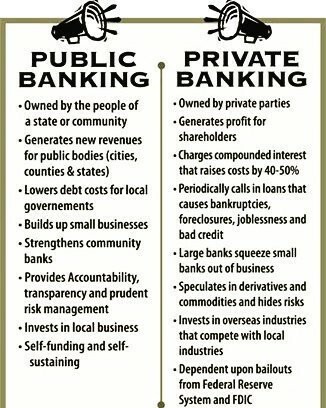 Public banks can exist at national, state, or city levels. 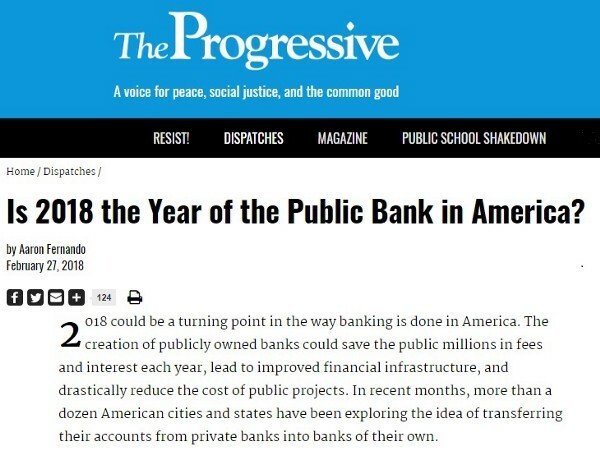 In other words, imagine if every state and major municipality in the U.S. developed their own socially responsible public banks, owned by the public and accountable to them. What need would cities and states have for Wall St.? Why pay any private bank interest and fees with our tax dollars when that money could simply be reinvested into the public good, and set to promote the public good by design. Rather than simply tolerating the rapacious private banks, we will have banks that are proactive agents in creating a better society. Rather than cynically accepting that banks are by definition exploitative, we can dare to define a new type of bank altogether- one that by its very nature is designed to be transparent and accountable to the people, to serve local community development, to do all business in a socially and environmentally responsible framework; Banks that are our allies…People’s Banks. In this way, we move from reactive to proactive. Rather than reacting to private banks for doing what they are simply designed to do- prioritizing private profits over social or ecological considerations- we instead proactively create our own banks that are built to develop their local communities by prioritizing social good and sustainability with public profitability. Divestment that is institutional (like universities divesting) and individual (like individually moving your bank account to a credit union) will always have a place. But specifically in the realm of public sector funds unwrangling the tentacles of rapacious finance, People’s Banking is the only true divestment that strikes at the root of this issue. The assumption of democracy is that our system will reflect and be accountable to the will of the people. But while elected officials maintain the political sphere of persona and puppetry, it is actually the economic sphere that truly determines the state of our society and to which the political sphere is in fact subordinate- hence the glaring realities of oligarchy, income inequality, and the dependence of winning elections on private moneyed interests that permeate the defining discourse of our era. It is then these moneyed interests that determine the direction of our current system since they are clearly its benefactors (follow the money), and it is exactly these very people who are unelected and unaccountable. Voting has a place, but so long as plutocracy and private banking maintain their free reign, the process will be largely one of window dressing, as decades of the hope/disappointment cycle can attest to. By bringing banking under public control, so that the bankers that have the responsibility over our economy are accountable public servants rather than private casino gamblers, we can finally make progress towards a system that is legitimately, rather than superficially democratic. This is why in California, we have organized a coalition called the California Public Banking Alliance– which is a network of municipal public bank organizers across the state. The vision is to have municipal public banks in all major cities in California. We hope to inspire other cities and states to join the public banking movement. Ultimately, every major city and every state in the nation will have its own public bank, and then we will look back and wonder how we ever allowed Wall St. such intimate access to public money. We’re on the verge of a great shift and it’s imperative that the momentum is maximized. Motivated and organized activists around the country should not overlook the fact that simply divesting still results in another private bank providing financing for public projects. We must realize that creating our own municipal and state public banks is the true end game of the process. But when the public banking movement can firmly take hold in the imagination of activists nationwide, and state after state, city after city create socially responsible Public Banks, we will truly have started a Revolution.